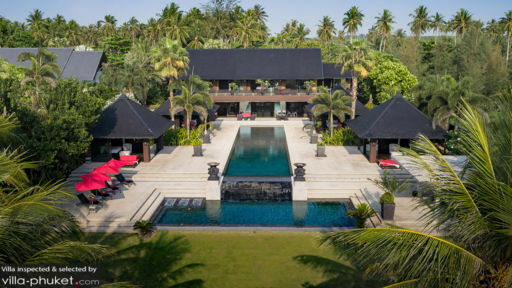 An ideal tropical destination for the much-awaited family vacation, Villa Saanti is a stunning retreat located right on the untamed, white-sand Natai beach in Phuket, Thailand. The six-bedroom villa is meant for 12 adults and six children offering world-class services and amenities including two infinity pools, Jacuzzi, barbecue area with a wood-fired pizza oven, access to the beach with kayaks available, and a breath-taking view sweeping across the Andaman sea, lush tropical foliage, and dense coconut groves! Enjoy a wholesome and private holiday with your loved ones on this slice of paradise you get to call home for the next few days. There are six bedrooms at Villa Saanti including the master bedroom, upstairs guest room, and four ground-level guest pavilions, each furnished with king-sized beds and with en-suite bathrooms. The master bedroom is the most spacious and comfortable room with a king-sized bed, private balcony with views dominated by the sea, and a massive flat-screen TV with DVD player. The upstairs guest bedroom is again furnished with a king-sized bed and also adjoins to a private balcony. Each bedroom is accompanied by an en-suite bathroom. The four guest pavilions are located on the garden and around the swimming pool with easier access. They are fitted with king-sized beds for a comfortable night’s sleep and also come with en-suite bathrooms. Set against a mesmerising panorama are the two infinity swimming pools at Villa Saanti, one of them even fitted with an excellent Jacuzzi for some hydrotherapy. The sand-washed sun deck is furnished with deck chairs as well, so you can stretch your limbs after a swim and take a relaxing nap under the tropical sun. A BBQ has been setup for guests, complete with a wood-fired pizza oven for endless pies that you can enjoy while gazing out at sea, lounging in the sunken outdoor sala or the alfresco dining area. There is a garden that kids will especially love to run around on and through the coconut trees as well as other foliage! Found at pool-level, the splendid living room at Villa Saanti is luxury personified with modern interiors and an elegance so intrinsic to the essence of this holiday home. Gorgeous lighting, overhead chandeliers, comfortable and plush seating, and an open-concept layout allows for endless views from where you sit. Designed with care and great detail, the living room is the ideal place to retire to once you’re tired after a day of fun and excitement. Also, you will find another indoor dining area, a more formal setting, with twelve chairs to set all the guests of the villa with ease. With sprawling views of the gardens and luscious vegetation, the feast in front of you will seem all the more scrumptious and mouth-watering. The villa even houses a games room with Wii, DVD player, 55” TV, etc. for your entertainment. There is a guest kitchen which is fully-equipped with modern amenities and appliances for your needs. 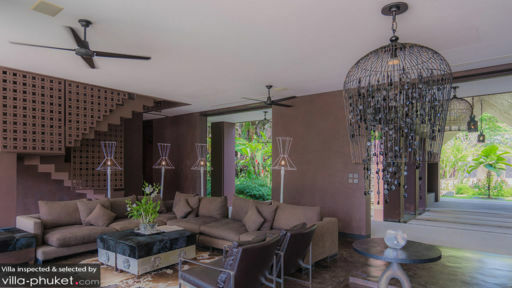 Villa Saanti prides itself in offering five-star amenities to guests all spearheaded by a staff that includes a villa manager, chef, housekeeping staff, pool/ garden maintenance, security etc. There is a fully-equipped gym on the property for your fitness needs and if you wish you can indulge in in-villa massages etc. for an additional cost. The villa offers the use of two kayaks, surf boards, complimentary wifi, etc. If you wish, you can even request the services of the chef for meals upon request. If you’re looking for a quiet holiday with the sun, sand, and sea to keep you company, then Natai beach with its serene ambiance and calm waters is just the place for you. You can relax, take out the kayaks, and sunbathe to your heart’s content. In case you start to miss civilisation, head to Baba beach club for great music, or further away are hot springs on Phang Nga bay.